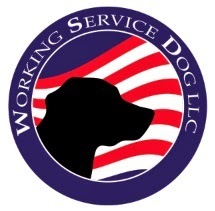 Working Service Dog Blog: Do I Need to Know How to Register A Service Dog? One of the first questions that will likely cross your mind after getting a service dog is how to register a service dog. Luckily, the answer is easy: you don't have to register a service dog. Registering a service dog is not required under the Americans with Disabilities Act. All public establishments, including restaurants, stores and airplanes, must allow you and your service dog to enter. According to the ADA, businesses are not allowed to require proof of service dog registration or documentation stating that your service dog has been trained. Businesses may only ask if the animal is required due to a disability and what work the animal is trained to do. But What If My Dog is a Therapy or Emotional Support Animal? Therapy and Emotional Support Animals are not considered to be service dogs and are not included in the laws set by the ADA. A note from a doctor declaring an animal to be an emotional support animal does not mean that it is the same as a service dog. However, registration is not required for therapy or emotional support animals either. If It's Not Required, Why Are There So Many Registration Sites Online? Many service dog registration websites take advantage of the fact that many people don't know the laws. They try to sound official and convince unsuspecting individuals that registering your service dog is necessary. There is no national registry service for service dogs and none of these websites are affiliated with the government. You do not need to know how to register a service dog at all. As mentioned earlier, it's not a requirement to register your service dog and you are not breaking any laws by not doing so. There are no legal repercussions that you need to worry about but you may still receive questions from business owners and other people in public. What If I Get Asked for Proof of My Service Dogs Duties? Despite the laws set by the ADA, it's not uncommon to have someone, such as a restaurant or store employee, question you about the validity of your service dog. Thankfully, outfitting your dog in a service dog vest is often an accepted form of service dog identification and helps to quickly resolve any debate over the purpose of your dog in public locations. Service dog vests and identification tags make it easy for the public to see that your dog is a working dog and you shouldn't be asked for any further forms of registration. Again, you do not need to know how to register a service dog at all, regardless of what level of service it is providing – Service, Emotional Support or Therapy related.